Unibet is aimed at Northern Europe as much as it is at the UK and is well-known in Scandinavia in particular – and just like a certain well-known Swedish car brand it’s reliable, does everything in style and never really goes out of fashion. They won eGaming Review’s Live Operator of the Year in 2009, and have been around since 1997, so they clearly know what they’re doing: As well as live gaming, they offer sports betting, poker, bingo, two casinos and a games section, so there’s a huge amount of choice. The Red Casino houses games from Net Entertainment – a Swedish company that makes some of the best slots on the planet, no questions asked: The era-defining Gonzo’s Quest can be found here with its eponymous hero growling and scratching his way through the most stylish playing environment the slots world has ever seen; or why not check the film-noir adventures of Jack Hammer on either of two games themed around the frazzled detective and his cast of seedy 1930s villains? Net are on the case with branded games now as well, following a deal with Paramount Studios that first gave us the first Frankenstein game to use imagery from the original Boris Karloff film, and then the much-awaited slot based on the Al Pacino version of Scarface. Moving over to the Black Casino, you’ll find Microgaming slots here in all their glory along with around 15 tried and tested videopoker challenges. Play optimally on one of the 3 bonus poker games to enjoy an expected return in excess of 100%, and enjoy the retro visuals and sound that go with them for a full-on Vegas casino floor experience. Whilst you’re here, though, don’t forget the Blackjack: Microgaming have always been particularly strong in this direction and offer more choices than everyone else: Take your pick from the Atlantic City variant, the Vegas Single Deck game, Vegas Downtown, High Streak, Real Deal or Double Exposure Gold. Normally you won’t find more than two tabs in any casino for virtual slots, table and arcade games – but at Unibet there’s a third: Click the Games tab and you’ll find a smorgasbord of popular slot and arcade games from IGT and some other niche software houses like Sherriff Gaming. This is where you’ll find the already-infamous David Hasselhof slot game along weith some household names favourites like Deal or No Deal World Slot and Battlestar Galactica. On top of this there’s are also live roulette, Blackjack and Baccarat steamed in from Eastern Europe, so it is literally impossible to get bored here. At Unibet it’s more a case what software they don’t use, rather than what they do. Playtech don’t have a foot in the door here, but you’ll find games from just about everyone else. It’s all instant play and you can play in demo mode to your heart’s content. Bliss. 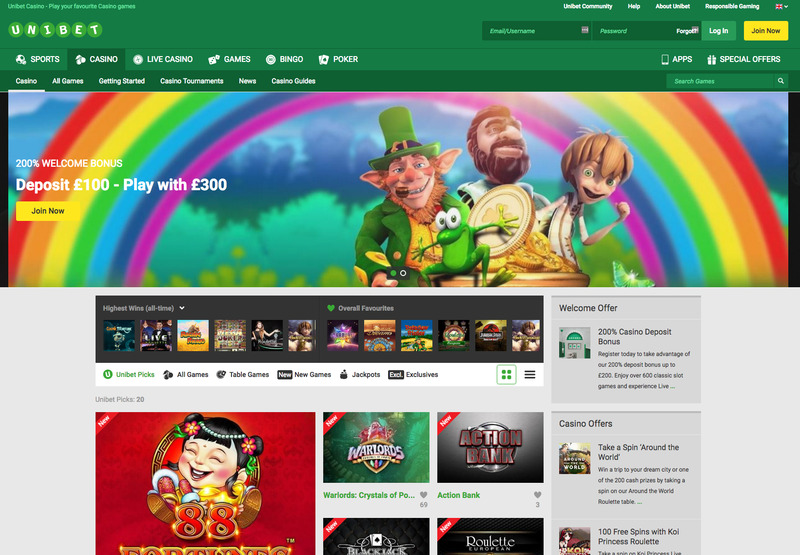 Like most sites aimed at Northern Europe, Unibet has a reassuringly functional look and feel to it, imbuing it with the same level of reassurance that you always get from a UK sportsbook site. It also navigates well, and we didn’t struggle to find any information whatsoever. 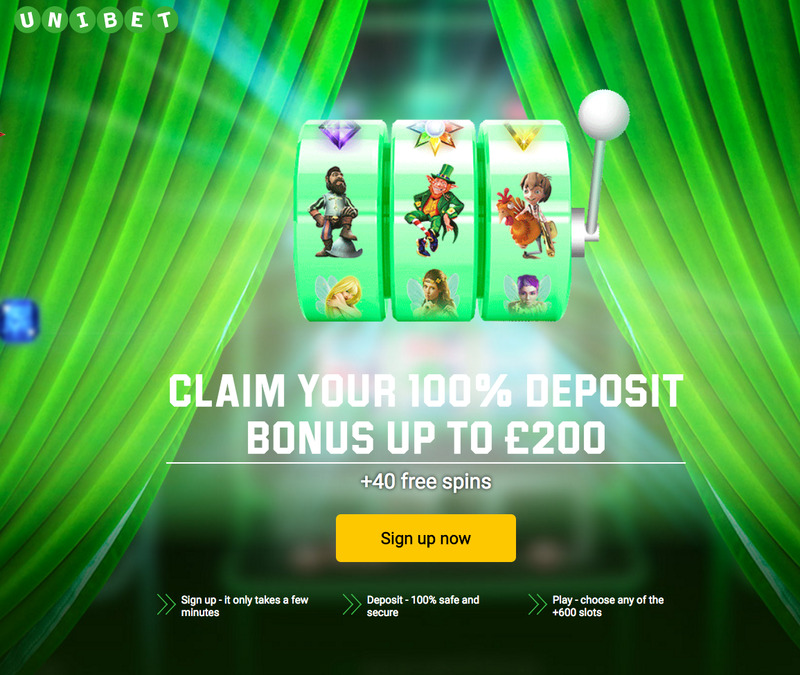 Unibet keeps things refreshingly simple with a 100% welcome bonus up to £100, and nothing more than that. You can deposit at Unibet with Visa (credit, debit or Electron), Mastercard, Maestro, Solo, Switch, Entropay, Skrill, Neteller, Paysafecard or UKash vouchers. Unibet has an eCogra Safe and Fair seal, and uses P128-bit SSL technology for transactions and personal data. Unibet Casino is operated by Unibet International Ltd in Malta, and regulated by the Lotteries and Gaming Authority of Malta.